This is a common trap some players fall into. They expect their superior game over bad players to emerge in a single session, and they become angry when it doesn’t. 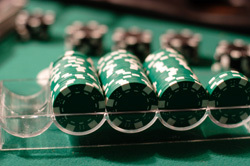 Unfortunately, as we have seen, expertise emerges over the long run in the game of poker. In fact, the structure of the game is set up as a kind of “safety net” for the bad player. He has to make a ton of mistakes in order to climb out of this net – and he will, eventually. But it will often allow him to hang on for a surprisingly long time before his mistakes catch up with him. So you’ll be in games where it’s obvious you’re the better player, and yet, no matter what you do you can’t get it into the game you’re playing. Don’t force it – that usually backfires and makes matters worse. Play your game. Good players always come out ahead in the end.